Nutrients in stream ecosystems are most available to autotrophs and microbial heterotrophs when present as inorganic solutes in stream-water. 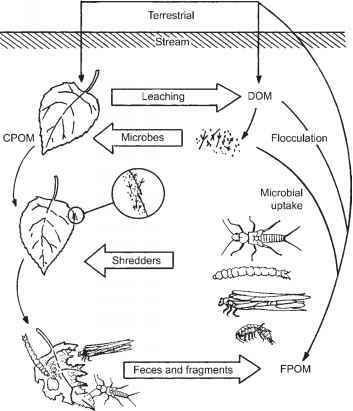 Biotic and abiotic uptake processes, almost exclusively associated with the streambed in smaller rivers and streams, transform and temporarily retain dissolved nutrients as they are transported downstream by flow, but eventually these bound nutrients will return to the water column in mineral form. Thus, uptake and retention slows the downstream passage of dissolved materials, and nutrient cycles are stretched into downstream spirals. To accommodate this unique feature of nutrient cycling in lotic ecosystems, stream ecologists have developed models that quantify transport distance and uptake rates, using the transport dynamics of a dye or other nonreactive solute for reference (Newbold et al. 1982a, Webster and Valett 2006). Since biotic and abiotic uptake occurs primarily at sediment surfaces, exchange of water between the channel and interstitial areas can greatly influence nutrient dynamics. Further, because uptake is not solely the result of biological assimilation but also includes physical-chemical processes and dissimilatory transformations, the terms solute dynamics and solute spiraling are more inclusive of all processes (Stream Solute Workshop 1990). Solutes that are not readily utilized by the biota or otherwise transformed from state to state by physical and chemical processes are referred to as conservative, and pass unaltered through the stream ecosystem. Reactive solutes, especially those that regulate metabolic processes, have their downstream passage retarded by uptake and temporary storage. Sodium and chloride are examples of conservative solutes whereas N and P are reactive (Wetzel and Likens 1991, Webster and Valett 2006). This distinction between conservative and reactive solutes, while useful, is not absolute, and may depend upon the relationship between supply and demand for a particular element at a particular time and place.